Check out these two examples of sitting and standing posture and see how you measure up. Are you close the positioning shown on the good example, or are you slumped in your chair with your head forward and your shoulders rounded like me? 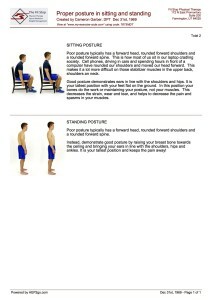 If you are tend to resemble the poor posture example we have some work to do. When assessing these types of symptoms the first thing I have people do is the “Wall Angel” exercise. I have them stand next to a wall facing outward with feet shoulder width apart and about 4-6 inches from the wall. Next they lean against the wall with bum, shoulder blades and head touching the wall. This gives me a great idea about the nature of their headaches and a good general screening of their posture. Next I have the patient move their arms up and down like they are making a snow angel on the wall. They do this while trying to keep their arms against the wall the whole time. If this is too painful, hurts in the shoulder joint, or seems impossible, you need to get in to see your PT ASAP! You are tight or injured and need some professional help. 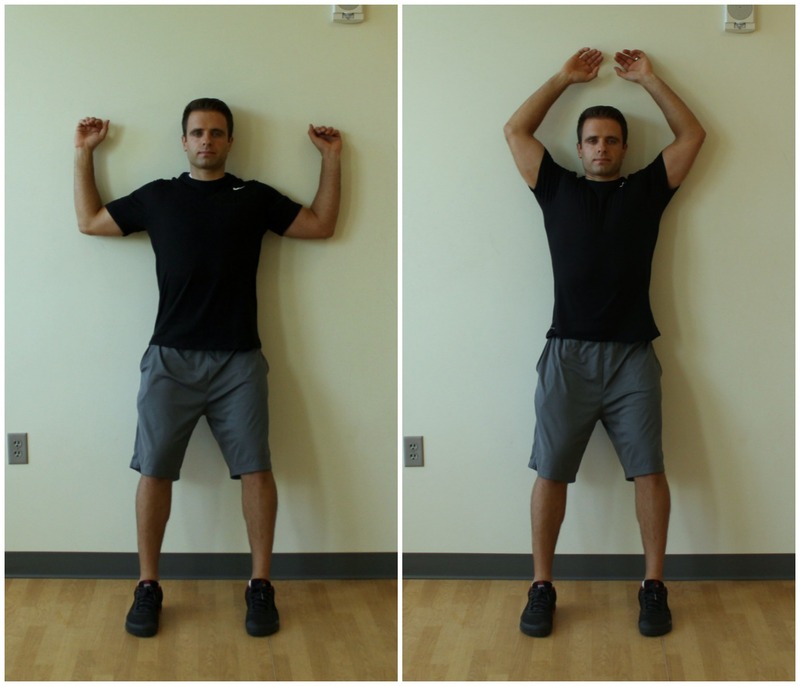 This simple screening exercise gives me a lot of information I can use to help patient identify where their poor posture is coming from. 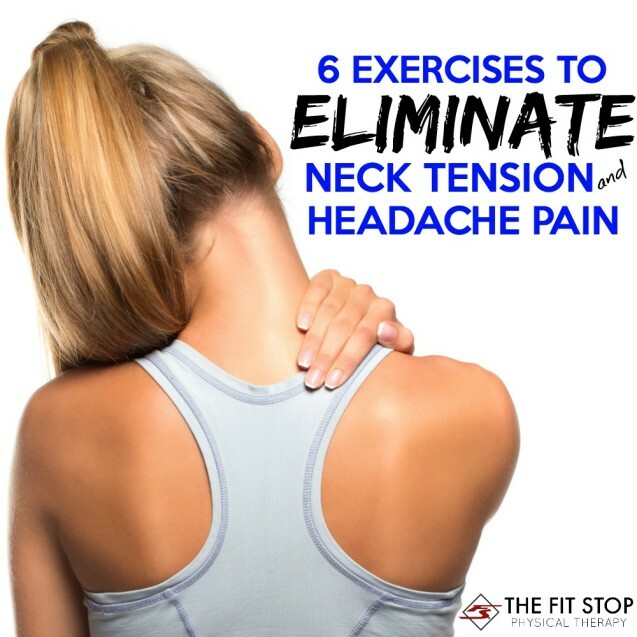 There are 4 main ways: Rounded shoulders, stiff lumbar spine or lower back, stiff thoracic spine or upper back, and stiff cervical spine or neck. It can be one or a combination of these factors which are affecting your posture. Whenever the shoulders are rounded it automatically brings the head forward and flexes the low back and upper back making them rounded as well. This also forces us to extend our neck to keep us from looking down at our toes. With good postural alignment the weight of our arms, shoulders and our 8 to 12 pound head rest firmly on bony support. (That’s right, your head weighs around 10 pounds! “Look at the size of that melon! It’s like an orange on a toothpick.” Name that movie) Instead, with poor posture our muscles, ligaments and tendons have to work overtime to support our poor postural performance. Because the muscles of your neck and upper back are always working overtime it starts to make those muscles tighten up in revolt. Eventually this tightness leads to the sore back, shoulders and neck which cause your headaches! So, how then do we combat this? We all know that we should have better posture, but what can we do to actively start making a change? The key is to begin to strengthen those overworked muscles and relax the muscles which have tightened in response to prolonged positioning. 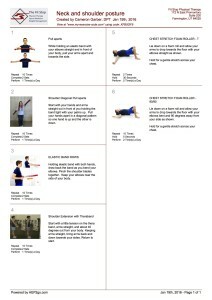 The idea is to begin strengthening the muscles of the upper back. Those muscles between the shoulder blades which roll your shoulders back when you pinch them together. Give it a try. Try to pinch your shoulder blades together. You’ll find your sternum rises, your head will center itself over your shoulder and you will decrease the rounding of your shoulders and upper back. Hold it for a second. This kind of feels good right? If not you might be really tight! Start doing this short 8-10 minute routine daily and then taper as your symptoms lessen. Incorporating these exercises into your routine long term will be critical in keeping your symptoms at bay forever!